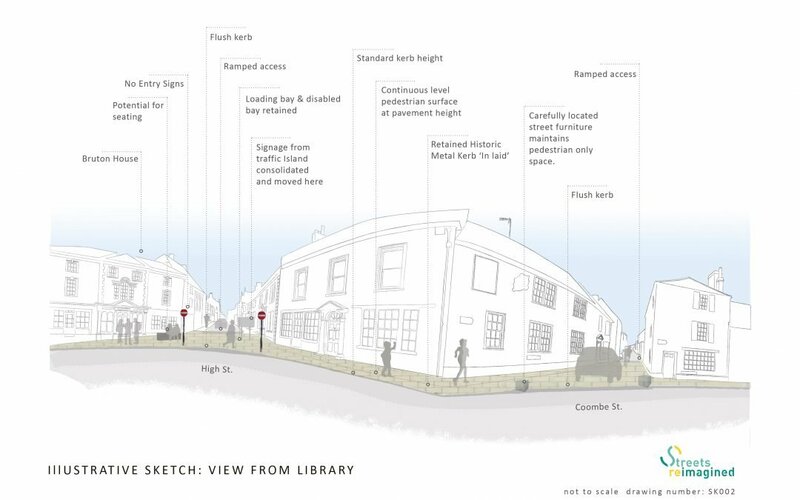 On 15 May 2018, Streets Reimagined presented their proposals for improvements to the Library Junction: the part of town that most people thought in need of improvement for pedestrians in our Town Plan Survey. This post summarises the proposals, gives details about why the Town Council is undertaking this work and describes what will need to happen if the proposals are to be carried forward. 44 Bruton residents attended the presentations, and gave feedback on the proposals. If you want your views to be considered too, please comment at the bottom of this post. The traffic island will be removed, and the two lanes at the eastern end of the High Street will be reduced to one lane. This gives a shorter crossing for pedestrians, and forces vehicles leaving the High Street to make more of a turn either left for Quaperlake Street or Coombe Street, or right for Patwell Street. (At the moment the road layout encourages vehicles from the High Street to continue into Quaperlake Street or Patwell Street without stopping). There will be a continuous paved area at the eastern end of the High Street, which will run, at pavement level, from the south side of the High Street to its north side and then across the bottom of Coombe Street to the north side of Quaperlake Street. Vehicles will enter and leave the paved area by gentle ramps. The ramps and street furniture will mark the route for cars. The whole paved area, with its street furniture, will be a strong visual marker that this is a space where vehicles have to slow down and take additional care. Pedestrians will be encouraged to cross Quaperlake Street by a paved crossing (at carriageway level, rather than raised) opposite Grove Alley, rather than to make a less safe crossing closer to the Library Junction itself. Why are we bringing forward these proposals? In the responses to our 2016 Town Plan Survey traffic was the single most frequently mentioned concern. Amongst many other questions we asked residents which transport improvements they saw as most important. As can be seen from the following chart, there was a large majority in favour of better walking routes being the most important, and a large majority thought making Bruton easier to drive through least important. Roads in Somerset ‘belong’ to the Highways Authority. In the case of the Library Junction the Highways Authority is Somerset County Council. For the proposals to be carried forward, the County Council will need to be satisfied that the proposals are necessary, safe and affordable. The funds to make the improvements will need to be found. Before the County Council goes ahead with any proposals its traffic engineers will carry out a safety audit of the proposals, to ensure that they make the road network more rather than less safe. Preliminary pricing suggests that these proposals will cost in the region of £60,000 to implement. Our County Councillor Anna Groskop has submitted a bid to the County’s Small Improvement Scheme for funding to support these proposals. At time of writing it is not yet known whether her bid has been successful. (If not, it may be possible for her to re-submit next year). Our past experience is that the County Council will then expect a local contribution of about 25% of the cost of a small traffic scheme such as this. The Town Council has already contributed £6,000 (£5,000 for the consultant fees for this design work, and a further £1,000 for a detailed topographical survey of the junction), but has not yet decided to contribute a further sum. Incorporate weight sensors in High st. Coombe st. and Quarperlake st. Linked to ANPR cameras to enforce the weight restrictions on the town. The technical drawings that have been uploaded are at such low resolution it is impossible to read the text within the proposal. Please can higher resolution drawings be uploaded. Thank you for your comments. We have now obtained higher resolution plans from our consultants and will upload them next week. Higher resolution images have now been uploaded. Sorry for any inconvenience.